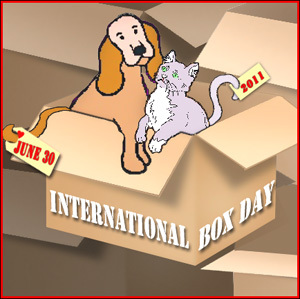 Today is one of my favorite days - International Box Day! All of us Monkeys enjoy boxes, but I am definitely the one who loves them the most. A new box can last months for me, and then when I tire of it, I pee in it so that I can move on to the next one. It's just my way of letting Mommy know that I want a new one. It's a very effective method because the peed in box is removed right away. The problem is that Mommy is a bit of a slacker and there's not always a new box at the ready. Mommy thinks the reason I like to pee in them is because when I was rescued from outside as a small kitten, I was rescued by a woman who had no experience with cats and she used to put newspapers in a box for us to pee in. Old habits die hard! Currently I am using this square box. It's nice and compact and hugs my body perfectly. It'll be a long time before I pee in this one! I've been a fan of boxes since infancy. This is an old photo of me enjoying a box as a kitten. I was a lot slimmer then and could fit in almost any box. Deli loves boxes too, except she prefers to sit on them. Personally I think she's missing out on the true box experience, but she's too stubborn to listen to me. There is no greater pleasure than a nice snooze in a perfect box! I mean, he's very cute, and he does look a little bit like Samson, but he's SO small! Also, he always tries to kick me in the head. What kind of boyfriend does that? Hey, little one - I'm not your mama! Sheesh! I hope this little frog turns into a handsome prince soon! It's been an exciting few weeks here with Bella's birthday and the arrival of our new Monkey Gabriel and I'm exhausted! 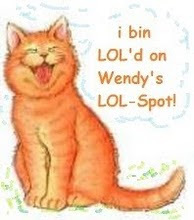 I'm on the steroids again so I don't have any itchies, but I'll be going to a cat dermatologist next time they come back. Hopefully the doctor can figure out what is causing my itchies. It's frustrating Mommy AND me! The good news is that Sweet Pea and Gabriel are crazy about each other. She wasn't very happy at first but the little guy has quickly turned her around with lots of play time and his cute little face. Deli, Bella and I have not met him yet, but as soon as he has his vet trip and he's free and clear of any fleas, we'll have him and Sweet Pea over for a Monkey social. It should be fun. Please join us in celebrating Bella's 12th birthday today! You don't look a day over 6 years old, Bella! We all love our sweet little girl! 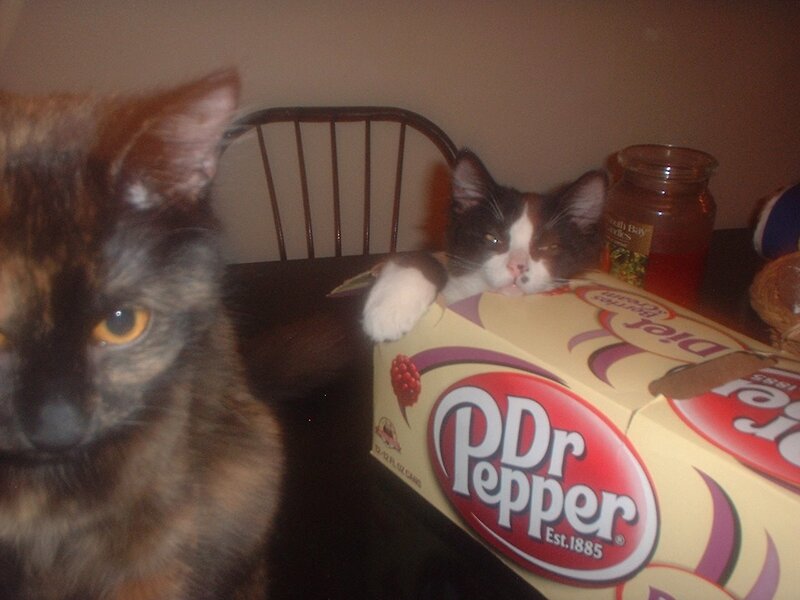 We are taking a break from kitten pictures today to get down to some serious business. The Treatswell Company is the Canadian distributor of Tiki Cat food and they gave us some different flavors to try out. It will be difficult to do all this eating, but we will do our best! We'll all test it and let you know how we like it....soon. Samson was kind enough to let me post today because I have SO much to say! First, I had a very long trip over 3 days to get to my new forever home from Chrystal's. My buddy, Scott, drove the whole way (I'm too small to reach the pedals)! We stopped for some play time. I really love Scott. He made sure I wasn't scared and let me sit on his shoulder during breaks. When I got to my new home, I met Sweet Pea. She's very pretty, but she's SO big! My new Daddy thought it would be better if she met me in the hall of the apartment building instead of me coming right into her house. ...but now she's coming around and playing with me a lot! I just love to play and Sweet Pea has so many toys! I know we promised you lots of pictures of Gabriel and Sweet Pea meeting, but something went wrong with the USB key and we only have the pictures Mommy took when she went to see him for now. We'll get the videos and pictures from the trip and when Sweet Pea met Gabriel for Monday, but in the meantime, here's the little one looking adorable! His eyes are a little mucky from the eye drops he was prescribed, but he's doing very well and is very interested in Sweet Pea. She is not as interested in him yet, but we think Gabriel is a charming little guy who will work his magic on Sweet Pea. Just a quick post to let you all know that Gabriel and Scott have arrived safely in Montreal. They got to Sweet Pea's house last night around 2 AM. We will have videos and pictures of their trip and Sweet Pea and Gabriel meeting for the first time in tomorrow's post. One year ago today we welcomed our darling little Bella into the house! You can read about how we got her by clicking HERE. 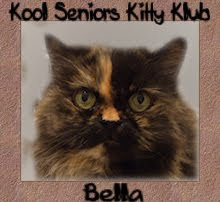 Bella is a diva and a bit of a snob, but we still love her and hope to have her with us for many, many more years! We think that eventually she'll love us as much as she loves Mommy and The Ball Guy. Our friends Sammy, Andy, Shelly and Judi made this fabulous graphic to help us celebrate the day. Thank you so much, guys! It's the perfect colour for our Bella! We also have good news about the first leg of Gabriel's journey. He is safely in Columbus with Scott and they will be leaving for Montreal on Wednesday morning. 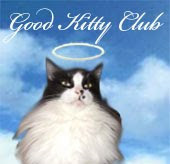 Thank you all for your purrs! I have so much exciting news that I just have to lie down! You may want to lie down too. 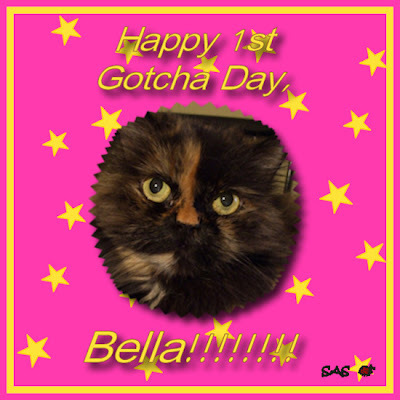 First, Bella's Gotcha day is tomorrow! It's hard to believe we've had that sweet, crabby girl in our lives for only a year! Please come help us celebrate so that maybe we can put a smile on her face. The second bit of exciting news is that Gabriel's trip to Montreal starts today! Our friend Scott is going to pick him up today, bring him home to his house in Columbus, then on Wednesday he'll drive to Montreal. We were unable to find someone close enough to help with the transport, so Scott volunteered to do the in-between. 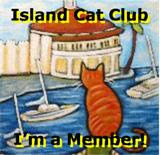 We are all very excited to meet Gabriel and we would appreciate purrs that Gabriel and Scott's trip goes well. Gossip is tiring! I'm glad I was lying down. As most of you have already guessed, Sweet Pea's new boyfriend is Gabriel! Mommy and The Ball Guy fell in love with him when they saw him on Chrystal's blog and the rest is history! Our friend Scott will be making the drive with Gabriel all the way from Indianapolis, IN (We featured Scott's cat Max on our blog recently), but we still need help with getting him from where Chrystal is bringing him (Effingham, IL) to Indianapolis. If anyone can help, Mommy says she will definitely pay the gas bill. If anyone along the way has considered adopting one of Chrystal's beautiful cats, please let us know. 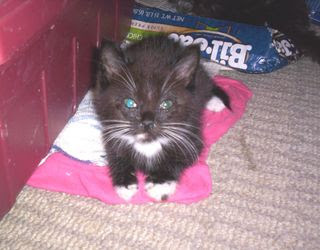 We would love to help bring a kitty to a wonderful new forever home. When I heard that the humans were looking for a live-in companion for Sweet Pea, I was a little bit worried. The humans just LOVE Torties, and who can blame them? My concern was that they would get another Tortie to live with Sweet Pea and I would have to show yet another new Tortie that I was the boss around here. Fortunately they decided on a boykitten and now I can relax. Mancats are very happy to take the backseat and be arm candy for us Torties...at least that's how Samson is. Also I'm hoping that Sweet Pea will leave MY Tuxie alone now that she'll have her own. She doesn't think I see the way she stares at Samson! I know you're all very anxious to hear about who we're adopting to live with Sweet Pea and we'll let you know very soon. We promise you'll just adore the little tyke! Yes, I look a little smug sitting here in my coffee box, but it's because for once the humans listened to me. A couple of weeks ago I suggested that the humans find a boyfriend for Sweet Pea so that she'd finally leave me alone. Not only did they immediately start looking for a potential candidate, but they also took my advice and searched for a little tuxedo boy. Yep, they found one! A lot of you may have even met him! We will give you all more details soon, but we are all VERY excited! We are adopting a new Monkey! Even though I will no longer be the only Monkey Mancat, I'm very happy that I will finally be able to take a snooze in peace! Sweet Pea will be so busy with her new boyfriend, she won't have time to come over and harass me.